Melting moments as the name says it all - they are delicate soft melt in mouth cookies.These short bread cookies were loved by all and they have a buttery flavor coated with the confectioner's sugar.These cookies can be made for Christmas and they are easy to prepare.I loved baking these cute round ball shaped cookies.This will make a good holiday gift for family in the coming festive seasons.Do give it a try & enjoy !!! -Sift the flours twice with salt.Keep aside. -Beat the butter with confectioner's sugar until soft.add vanilla extract. -Add in the flours until incorporated.Knead to a smooth loose dough.Refrigerate by covering with a cling wrap for 1 hour. -Pre heat oven to 350 degrees F and line 2 trays with parchment paper. 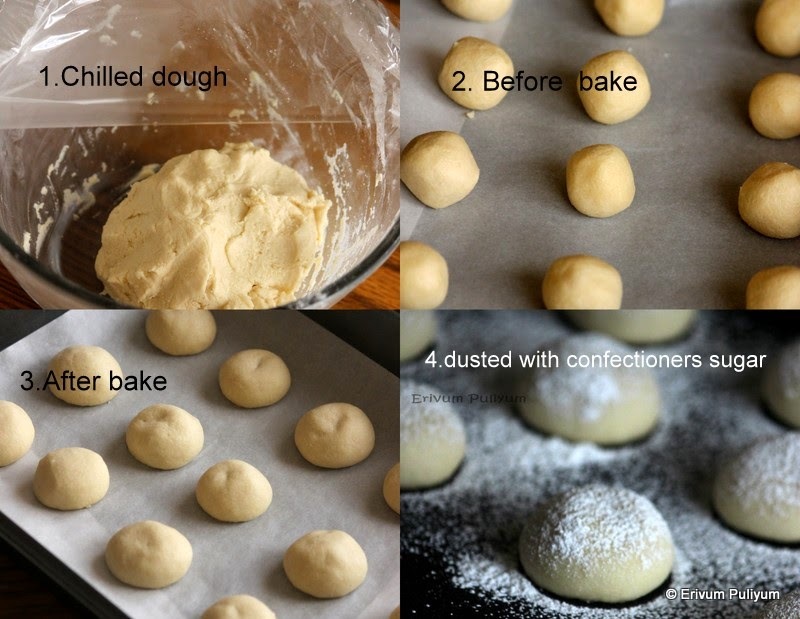 -Shape the cookies by making smooth balls of 1" size and placing,spacing them 1" apart on the tray. -Cool on wire rack for 3-5 mins.Transfer to a parchment liner and cool completely.Sift the confectioner's sugar on top of these cookies. -Enjoy or store in air tight containers. * These are very fragile cookies.Handle with care. PErfect cookies ..Fantastic captures as well. Wow Julie! Looks amazingly delicious. Wow, mouthwatering here.Perfect cookies. Looks great. simply fantastic... your cookies are making my mouth water! Perfect, beautiful and delicious cookies. Love the name. Have a very good day. Here is sunny and hot. Unbelievable in October. Hey, how is that you keep posting all my favourite recipes? Do u read minds? Heee. Lovely presentation with the flour dust. Best melt in mouth cookies for kids. Omg, cant take my eyes from ur scrumptious cookies..Adorable they are. I just love these cookies.. So delish just melt in mouth.. Loved the pic.. Butter cookies are always yum and it is one of the favorites in my house.